Shoes that roll. Once you lace up these shoes, you’re ready to take over the world! 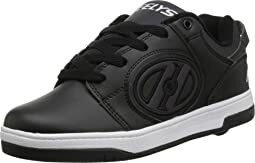 Exclusive to Heelys kids’ footwear, these powerful, lightweight athletic shoes feature a single-wheel housed in the heel, allowing athletes of all skill levels to walk, run and transition to a roll at any moment. 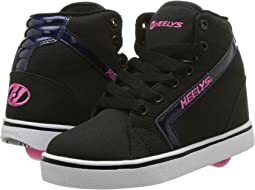 Roll into all situations, or simply remove the wheel and transform your Heelys into a pair of fashionable street shoes. 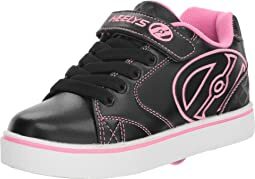 Heelys kids’ skate shoes also include Sidewalk Sports with Maxtrax™ technology. Maxtrax™ technology brings freestyle walking and riding to a whole new level. Now, worrying about staying on your board is a thing of the past. 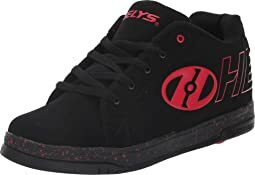 Heelys youth Sidewalk Sports is the lifestyle footwear line that locks your feet where they need to be. Active kids can now focus on their skills and not keeping their feet on their board. These high-performance shoes provide traction for action. 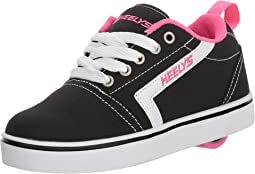 Though Heelys were originally designed as a performance rolling shoe, they are fast becoming a fashion statement among both kids and adults. 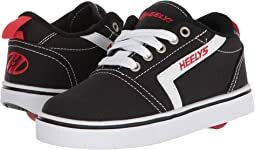 Your favorite Heelys sneakers or Heelys shoes provide a fun way to get around town, while also getting some exercise. 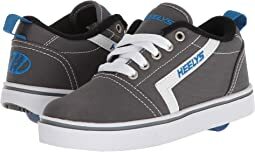 Zappos carries only authentic Heelys brand footwear and wheels, not to be mistaken for counterfeit, often misspelled Heelies. 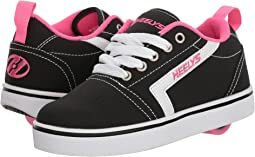 So remember it's spelled "Heelys", not "Heelies!" 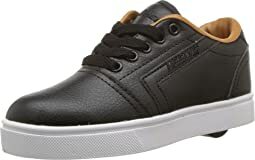 Whether it be for fun, performance, or casual use, you'll be able to find the pair of Heelys you're looking for at Zappos. 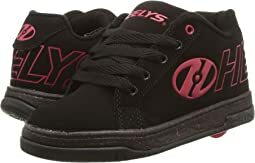 Heelys kids’ wheeled footwear - the original shoe with the wheel in the heel. Good fit and easy to ride! 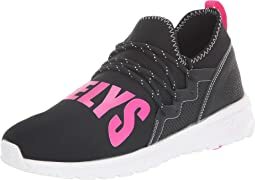 I bought these for my step-daughter for her birthday. She loves them! She wears a women's 7 and they fit. She loves the design on the shoe. She's still learning to walk/skate but excited she got them. 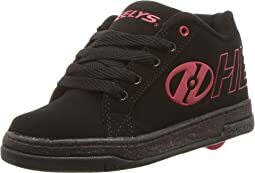 These Heelys are awesome! 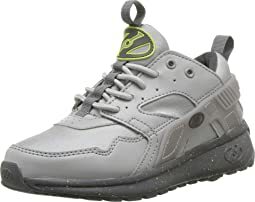 We got the silver gray reflective ones thinking that they were just adult gray color with us the cheaper price. But in different lights, they glow ghost white like a reflector. 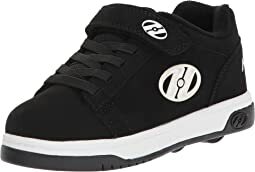 Maybe they are for safety at night, not that I’m letting my daughter where Heelys in the street at night, but they look really cool!! I bought these for my 6 year old nephew for his birthday. He loved them and had a ton of fun trying to master them. Thank God for knee pads and a helmet. LOL His first question was whether he could wear them to school and was happy when I said yes and just to put the bottom back in the shoe. They were really nice looking shoes and was his favorite gift. Even over a new swing set. ?? Much better than the picture. He said they were comfortable. I bought him a size 13 and he normally takes a 12.5 but I wanted him to have some wiggle room. Great gift. Will buy more when he outgrown these. 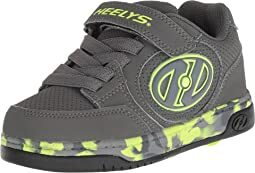 I bought these Heelys for my almost 5 year old son. They looked like a lot of fun. They are however quite dangerous for a child of his age. I do think they are fine for older kids. We took the wheels out and he’s using them as sneakers. Surprised my daughter with these. Look cute and colorful and she's getting complements from her classmates. She said they were hard to run in, but I figured they just needed breaking in. These are SO FUN! If you ain’t got a pair yet, what are you doing? 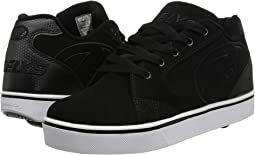 These are so good for $35. Would recommend! Fast delivery and good shoes like the picture! I’m trying it today and having a lot of fun! Great looking shoes and fun as well. They seem a little small - my son wears a men's 8 but had to get a men's 9 t fit properly. My eleven year old son LOVES them. He’s having so much fun. These were a little too large. 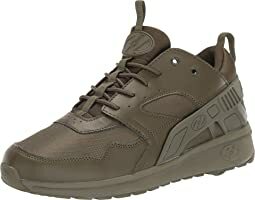 I read a review saying a men's 7 fit like a women's 8 but I think they fit more like a women's 9. 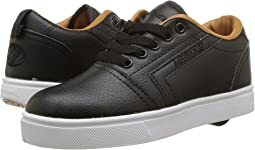 However this was my very first purchase with Zappos so I called to ask whether I should exchange for another size or just return and make a new order and the CS rep was super helpful. They made it super easy and I've already placed another order and will be ordering from them again in the future. It was even easier than my Amazon Prime returns so I am thrilled! Absolutely perfect! 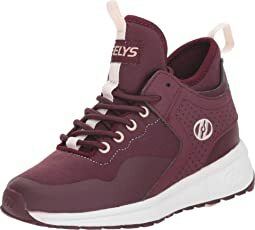 My son has been wearing Heely's for years so this is another pair in a long line of fun and excitement. Perfect fit and smooth rolling from here!! 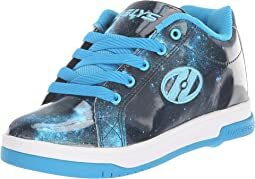 My son loves these heelys! They’re sturdy yet flexible enough to use to play and run. Exactly what my son wanted. He loves them. He has a wide foot so I was concerned but very easy for him to put on. After reading the reviews, I ordered a size up but it wasn't necessary. They are true to size. Quality seemed good and we're exchanging them for the smaller size. The heel bed is short to accommodate the wheel which helped its exterior appearance. The galaxy color looks amazing and my daughter loves it. 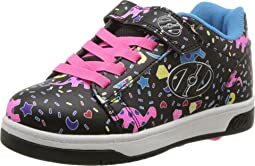 Heelies are easy to roll in and fun for kids. 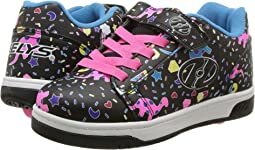 My 6 year old loves her new Heelys. She has never had roller shoes before, but was able to figure out how to skate fairly quickly. I love the quality of the shoes. They are made of heavy material that feels substantial and well-made. Very cute for my 6 year olds! Very cute for my 6 year old!